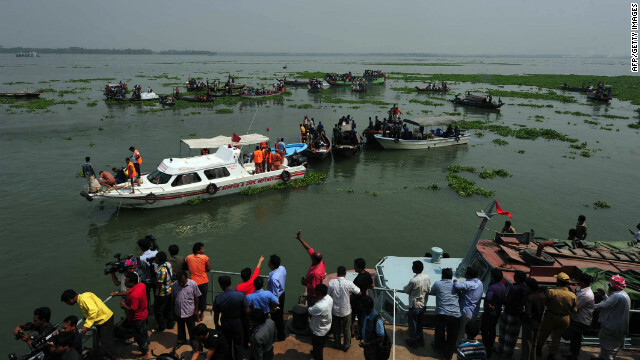 Rescue workers search for missing passengers Tuesday after a ferry accident in Bangladesh’s Munshiganj district. Dhaka, Bangladesh (CNN) — Rescuers searched frantically for survivors after a packed ferry carrying at least 250 people capsized in southern Bangladesh, killing at least 32 people, police said Tuesday. The MV Shariatpur-1 sank in the Meghna River after colliding with a cargo ferry early Tuesday while passengers slept, a survivor said. “We were seven in a cabin in the ferry, and six of my family members are still missing,” Mohammad Dulal Dewan told CNN. Dewan and his family were traveling to Dhaka, Bangladesh’s capital, to see his brother-in-law off to the United States. Shamim Fakir was scheduled to fly on his U.S. trip early Wednesday, Dewan said. He was still missing Tuesday evening. Mohammad Azizul Alam, the administrative chief of Munshiganj district, said officials had received a list of 61 missing people from families and the death toll might increase. “We believe many bodies are still trapped inside the sunken ferry, and the rescue operation is still on,” Shahabuddin Khan, police chief of Munshiganj, told CNN. Khan said divers from the Bangladesh navy and the Fire Service and Civil Defence took part in the operation in addition to police and the Bangladesh Inland Water Transport Authority. The water authority’s chairman, Khandker Shamsuddoha Khandaker, told reporters the ferry had been traced 70 feet (more than 20 meters) under water. About 30 people were initially rescued after the ferry collided with the cargo boat on the river in Munshiganj district, about 25 miles (40 kilometers) south of Dhaka. The ferry was traveling to the nation’s capital from Shariatpur district. Ferry accidents are common on Bangladesh’s vast river network. Hundreds of people die in such accidents every year as the operators often ignore rules. Nearly 4,000 people are estimated to have lost their lives in ferry accidents since 1977.